Sycamore is a common name that is applied used at various times and places to three very different taxa of trees, Ficus sycomorus, Acer pseudoplatanus, and all members of the genus Platanus. These trees are located in three different orders of flowering plants. Ficus sycomorus is the sycamore (or sycomore) of the Bible. It is a species of fig native to the Middle East and eastern Africa. It is also known as the sycamore fig or fig-mulberry. Acer pseudoplatanus is known as sycamore in Britain and Ireland. It is a species of European maple that is called "sycamore maple" in North America, or "plane" in Scotland. Platanus is a genus of trees of North America known as sycamores. They are known as planes in Europe. There are several species, including the American sycamore and the California sycamore. The term sycamore particularly is used for Platanus occidentalis, the American sycamore. These trees offers unique ecological, aesthetic, and commercial values. Ficus sycomorus, which was popularly cultivated by the ancient Egyptians, requires a tiny wasp in order to reproduce sexually, as opposed to grafting. The sycamore is a giant tree, standing as much as 6 meters (20 feet) wide; the wasp is a tiny insect. Yet, reflecting the harmony in nature, both depend on each other (mutualism), as the wasp needs Ficus sycomorus for a place to lay its eggs and the tree depends on the wasp to pollinate its flowers. Acer pseudoplatanus is noted for its tolerance of urban pollution, salt spray, and wind, making it a popular ornamental tree for planting in cities, along salt-treated roads, and in coastal localities. It also provides wood for furniture, flooring, and other uses. 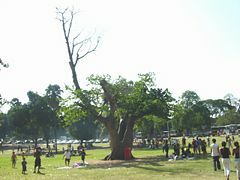 Members of the Platanus genus are among the more common trees planted in North American and Europe for shade, and are commonly found in public parks or city streets. This is also reflected in the common name of sycamore for street names in the United States. Ficus sycomorus, known variously as the sycamore, sycomore, sycamore fig, or the fig-mulberry (due to the leaves' resemblance to those of the mulberry), is a fig species in the mulberry family (Moraceae) that has been cultivated since early times. Ficus sycomorus is native to Africa south of the Sahel and north of the Tropic of Capricorn, also excluding the central-west rainforest areas. It also grows naturally in the southern Arabian Peninsula and in very localized areas in Madagascar, and has been naturalized in Israel and Egypt. In its native habitat, the tree is usually found in rich soils along rivers, but also in mixed woodlands. Ficus sycomorus grows to 20 meters tall (65 feet) and 6 meters (20 feet) wide, with a dense round crown of spreading branches. The leaves are heart-shaped with a round apex, 14 centimeters long by 10 centimeters wide, and arranged spirally around the twig. They are dark green above and lighter with prominent yellow veins below, and both surfaces are rough to the touch. The petiole is 0.5-3 centimeters long and pubescent. The fruit is a large edible fig, 2-3 centimeters in diameter, ripening from buff-green to yellow or red. They are borne in thick clusters on long branchlets or the leaf axil. Flowering and fruiting occurs year-round, peaking from July to December. The bark is green-yellow to orange and exfoliates in papery strips to reveal the yellow inner bark. Like all other figs, it contains a latex. In the Near Orient, F. sycomorus is a tree of great importance and very extensive use. It has wide-spreading branches and affords a delightful shade. The ancient Egyptians cultivated this species "almost exclusively," according to Zohary and Hopf (2000). Remains of F. sycomorus begin to appear in predynastic levels, and in quantity from the start of the third millennium B.C.E. Zohary and Hopf (2000) note that, "the fruit and the timber, and sometimes even the twigs, are richly represented in the tombs of Early, Middle, and Late Kingdoms. In numerous cases the parched sycons bear characteristic gashing marks indicating that this art, which induces ripening, was practiced in Egypt in ancient times." This species of fig requires the presence of the symbiotic wasp Ceratosolen arabicus in order to reproduce sexually. In the absence of this wasp, the plant is propagated by breaking off a branch and planting it. Although this insect is extinct in Egypt, Zohay and Hopf (2000) have no doubt that Egypt was "the principal area of sycamore fig development." Some of the caskets of mummies in Egypt are made from the wood of this tree. In the Bible, Amos 7:14 refers to the fruit of the sycamore, which is of an inferior character; so also probably Jeremiah 24:2. At Jericho, Zacchaeus climbed a sycamore-tree to see Jesus as he passed by (Luke 19:4). 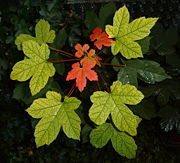 Acer pseudoplatanus is commonly known as sycamore in many parts of Europe, sycamore maple in North America, and plane in Scotland. It is one of the most common maples in Europe, native to central Europe, from France east to Poland, and south in the mountains to northern Spain and Turkey. Sycamore maples now occur throughout the British Isles, having been introduced in the seventeenth century (Preston and Dines 2002). A. pseudoplatanus is a deciduous tree that reaches 20 to 35 meters (65 to 115 feet) tall at maturity, with a broad, domed crown. On young trees, the bark is smooth and gray, but becomes rougher with age and breaks up in scales, exposing the pale-brown-to-pinkish inner bark. The leaves are opposite, 10-25 centimeters long, and broad with a 5-15 centimeter petiole, palmately-veined with five lobes with toothed edges, and dark green in color. Some cultivars have purple-tinged or yellowish leaves. The monoecious yellow-green flowers are produced in spring on 10-20 centimeters pendulous racemes, with 20-50 flowers on each stalk. The 5-10 millimeter diameter seeds are paired in samaras, each seed with a 20-40 millimeters long wing to catch the wind and rotate when they fall; this helps them to spread further from the parent tree. The seeds are mature in autumn about 6 months after pollination. The sycamore maple is noted for its tolerance of wind, urban pollution, and salt spray, which makes it a popular tree for planting in cities, along roads treated with salt in winter, and in coastal localities. It is cultivated and widely naturalized north of its native range in northern Europe, notably in the British Isles and Scandinavia north to Tromsø, Norway; Reykjavík, Iceland; and Torshavn on the Faroe Islands. In North America, escapes from cultivation are most common in New England, New York City, and the Pacific Northwest. It is planted in many temperate parts of the Southern Hemisphere, most commonly in New Zealand and on the Falkland Islands. The popular cultivar "Brilliantissimum" is notable for the bright salmon-pink color of the young foliage. Sycamore is planted for timber production; the wood is white with a silky luster, and hard-wearing, used for furniture and flooring. Occasional trees produce wood with a wavy grain, greatly increasing the value for decorative veneers. European sycamore is a traditional wood used in creating necks, backs, and scrolls for violins. Sycamore flowers produce abundant nectar, which makes a fragrant, delicately flavored and pale-colored honey. Stages in opening leaf buds. The genus Platanus is a small genus of trees native to the Northern Hemisphere. They are the sole members of the family Platanaceae. While known as sycamores in North America, they are known as planes in Europe. They are mostly found in riparian or other wetland habitats in the wild, though proving drought tolerant in cultivation away from streams. Members of Platanus are all large trees, up to 30–50 meters tall (98-164 feet). With the exception of P. kerrii, which is evergreen, they are all deciduous. The flowers are reduced and are borne in balls (globose head); 3–7 hairy sepals may be fused at base, and the petals are 3–7 (or none) and spathulate. Male and female flowers are separate, but on the same plant (monoecious). The number of heads in one cluster (inflorescence) is indicative of the species (see table below). The male flower has with 3–8 stamens; the female has a superior ovary with 3–7 carpels. Plane trees are wind-pollinated. Male balls fall off the branch after shedding their pollen. The female flowers, on the other hand, remain attached to the branch firmly. After being pollinated, the female flowers become achenes that aggregate on the ball. Typically, the core of the ball is 1 centimeter in diameter and is covered with a net of mesh 1 millimeter, which can be peeled off. The ball is 2.5–4 centimeters in diameter and contains several hundred achenes, each of which has a single seed and is conical, with the point attached downward to the net at the surface of the ball. There is also a tuft of many thin stiff yellow-green bristle fibers attached to the base of each achene. These bristles help in wind dispersion of the fruits like dandelion. The mature bark peels (exfoliates) off easily in irregularly shaped patches, producing a mottled, scaly appearance. Very old bark may not flake off, but can crack instead. The base of the leaf stalk (petiole) is enlarged and completely wraps around the young stem bud in its axil. The bud will be exposed only after the leaf falls off. There are two subgenera, subgenus Castaneophyllum containing the anomalous P. kerrii, and subgenus Platanus, with all the others. Recent studies in Mexico (Nixon and Poole 2003) have increased the number of accepted species in this subgenus. 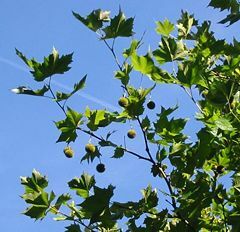 Within subgenus Platanus, genetic evidence suggests that P. racemosa is more closely related to P. orientalis than it is to the other North American species (Feng et al. 2005). There are fossil records of Platanus trees as early as 115 million years (the Lower Cretaceous). Despite the geographic separation between North America and Europe, species from these continents will cross readily resulting in fertile hybrids. Feng, Y., S.-H. Oh, and P. S. Manos. 2005. Phylogeny and historical biogeography of the genus Platanus as inferred from nuclear and chloroplast DNA. Syst. Bot. 30(4): 786-799. Retrieved November 1, 2007. Humphries, C. J., J. R. Press, and D. A. Sutton. 1992. Trees of Britain and Europe (Hamlyn guide). The Hamlyn Publishing Group Ltd. ISBN 060057511X. Hessayon Dr. D.G. 1993. The Tree & Shrub Expert. Waltham Cross, Herts, England: PBI Publications. ISBN 0903505177. Nixon, K. C., and J. M. Poole. 2003. Revision of the Mexican and Guatemalan species of Platanus (Platanaceae). Lundellia 6: 103-137. Preston, C. D., D. Pearman, and T. D. Dines. 2002. New Atlas of the British & Irish Flora: An Atlas of the Vascular Plants of Britain, Ireland, the Isle of Man and the Channel Islands. Oxford: Oxford University Press. ISBN 0198510675. Flora of North America: Platanus. This page was last modified on 9 November 2015, at 15:25.